It’s All About Books goes #Litsy !! Confession: I hadn’t heard about this bookish App until earlier this week. I’m not sure if I’ve been living under a rock or if it’s just that I don’t really use a lot of Apps in general on my phone… But after having great experiences joining both Twitter and Instagram this year, I decided to give this one a go. I’ve been asking around about this App on Twitter and people seem pretty positive about Litsy… So It’s All About Books now officially has its own Litsy page! So far I’ve managed to spam my new account with a bunch of reviews of a few of my favorite reads, but I will keep uploading new content during the next few weeks. 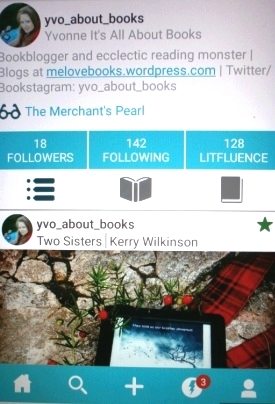 This entry was posted in Random Rambles and tagged bookish app, litsy, random rambles by Yvo. Bookmark the permalink. Good to know I wasn’t the only one haha. I’m not sure if I will be able to keep up with it but so far I like the idea of this App. I really like the idea behind this app and it’s quite user-friendly! My only complaint would be that you can only access your account on your phone (unlike twitter and instagram). I heard about Litsy in a BookRiot post http://bookriot.com/2016/05/12/litsy-if-instagram-and-goodreads-had-a-perfect-baby/ . I loved the idea of it. I downloaded it immediately but I have found little applicable use for it. I am not artsy. I didn’t just cook a gourmet meal with a glass of wine, and stage my current read next to it. Are you still using Litsy? To be honest, I haven’t really been using it since I got in a reading slump last year… I still have the account, so I might go back to using it later this year, who knows? I am on Litsy but honestly I forget about it! I’m not great at updating my info over there. Hope you enjoy it! I’m not sure if I’ll be able to keep up with it either along with Twitter and Instagram, but I like the idea behind this app so far. Awesome! I’ve never been on Litsy before and I just recently sign up for it, so we’ll see how this goes! Thanks for following me there! It’s not so good anymore? I’ve heard about this but it’s hard enough already posting on Goodreads and Netgalley and Amazon UK and US.. I think I have enough work with those, but it seems like a great app as well! I was completely unaware until a few days ago as well. 😉 I like the app so far; seems to be really easy to use and the community is superfriendly. We’ll see how long I’ll be able to stick with it though haha. I read this post and was rather easily persuaded – the app is downloading on my phone as I type. I will see how I go with it. It may end up being one of those social media accounts where my account ends up languishing all forgotten, but it might be my new favourite.